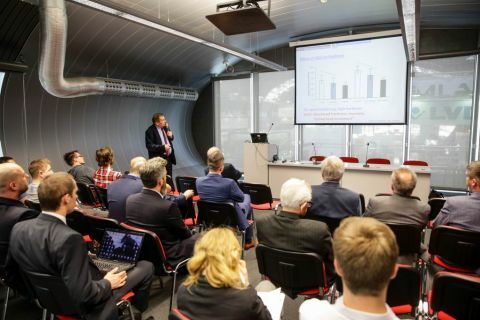 A series of industry lectures under the umbrella-title "Laser processing technologies" is organised as part of this year's5th STOM-LASER Laser and Laser Technology Expo Stom-LASER in Targi Kielce in cooperation with Metal Laser Processing Research Centre of Kielce University of Technology and Polish Academy of Sciences. The conference focused on broadly defined possibilities of laser machining technology use in industry. The meeting participants had the opportunity to become acquainted with the latest research and development results, development directions for this technology. One of the laser treatment methods presented cold gas injection coatings technolody introduced by doctor Wojciech Żórawski from the Kielce University of Technology. Laser treatment offers increased number of unique industry applications. The avoidance of adverse heat influence on the coating material particles is its main advantage. Now the technology is used for repairing corroded helicopter parts. This is just one of the many examples. The fluence of the laser beam influence in photodynamic ablation was discussed by Doctor Engineer Piotr Sęk PhD. (CLTM) The popularity of the laser incremental manufacturing technology with the use of metallic powders is growing - this is what the lecture of Engineer Bolesław Klein PhD. from TRUMPF was about. TRUMPF also presented innovative machines used forincremental technologies and among them the TRU PRINT 1000 for selective powder remelting and TRU LASER CELLL 3000 used for laser deposition. and practical tips abundance on how to implement scientific achievements in specific production processes. The STOM-Laser Expo is a unique place. The artmoshopere is conducive to relationships and commercial contacts establishment - emphasized the representatives of the Metal Laser Processing Research Centre of Kielce University of Technology and Polish Academy of Sciences.